How is your shopping, wrapping and baking and spreading good cheer going as we head to Santa's big day. My shopping is done, my gifts are wrapped and my baking done. I feel so ahead of the game this year. So yesterday no Bears Game so Terry and I took a drive to Geneva for a little lunch and I stopped in one of my fave shops in Geneva. I wanted to show you what I got. This sweet little Joy pillow that is made of old vintage necklace and jewelry pieces. Loved this when I saw it. So I have it with some of my other pillows on my chippy bench in the entry way. I think I will keep it out even after Christmas to spread joy through the winter months. Too pretty to put away RIGHT?!!! It was a nice day to have to ourselves. No malls or crazy shoppers and peeps forgetting what the season is really all about. Just the two of us having a nice day in Geneva and wonderful quiet lunch together. We stopped in at a few little shops. It was a nice peaceful day in the midst of all the hustle and bustle. Hope as we slide on down to Santa's big day and all the millions of things left to do you will find some moments or hopefully hours of peace and quiet to enjoy. Could you two be any cuter? Love the beautiful pillows you found, Kris. So happy that you have everything done...I am still behind the game a bit....but hopefully by the end of the week I can see the light at the end of the Christmas tunnel!....Love the pic of you and the love of your life! Your new JOY pillow is wonderful! Such a pretty and creative pillow and I agree with you...keep it out after Christmas! I am so looking forward to my kids being finished with school this week and then I can really enjoy the holiday with them w/o the stress of homework and alarm clocks! They are beautiful, and much too pretty to put away! Glad you have a good shopping partner. That pillow is lovely and I would keep it out. We all need to remember to find the joy in the little things! Beautiful pillow, Kris! And I love the picture of you and hubby...darling!! That is a cute pillow! Merry Christmas!! Hellooo Kris... FaB PHoto of you and Terry!!! Love the pillow, so cute. Yes I am actually finished too and enjoying the season without no hustle or bustle. Have a lovely week. JOY is my favorite word! Love the pillow and I would so leave it out all winter long. Very nice photo of you guys!!! Steve, Lulu and I had a quiet day yesterday - a 6 mile walk and a stop for a beer/coke along the beach. Lulu had her first outdoor restaurant experience and did great. 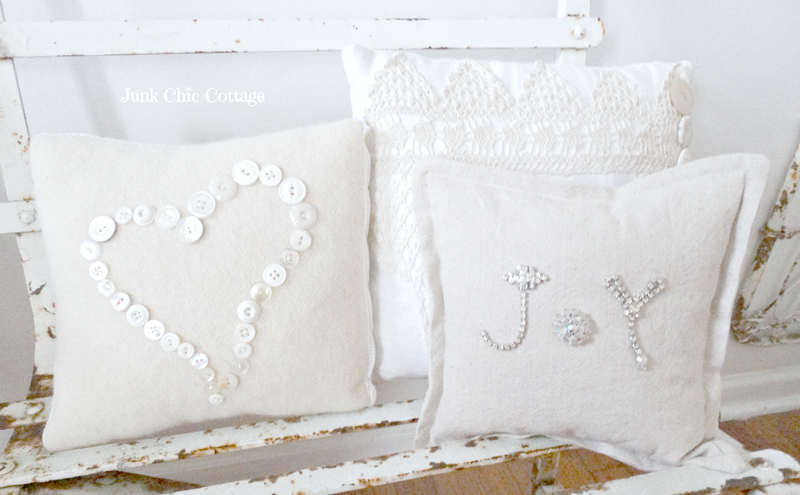 I love the button pillow and am thinking I need to make some for Valentine's Day. I am loving white on white. I forget to tell you that Steve is mad at you. He is now addicted to cocoa in his coffee and he knows it isn't good for him. He really liked getting the gift and was surprised when I told him it was for him. You two are a great couple. Love your new pillows. Love the Joy pillow and yes, I agree, it should definitely stay out past Christmas. Beautiful photo of you and your husband too. And I so wish I was as organized as you and had everything done but I am not quite done yet. Kris, I love those pillows. I just bought some fun stuff at the discount fabric store to add a holiday pillow to my all white bed. I was thinking I needed a pop of color, because of the season, but your white on whites have me thinking in a new direction....thanks for the inspiration! AND yes! That pillow is too pretty to put away! Enjoy! You're so lucky to be done with everything! I still have some shopping left and gifts to wrap. Love your new pillows. Cute pic of you and your hubby too. What a cute couple! I can see why you love the white Joy pillow-I do too! What a cute photo of your and Terry. There's nothing better than spending time with your honey! What fun pillows! Just returned back from our trip ... Mid 70's felt like a hug! Oh that cushion is adorable Kris. I'd want to keep it out all year too. The photo of you and your hubby is so nice and a lovely reminder of a perfect day spent together. Oh Kris what a lovely pillow and yes, I would definitely keep it out after Christmas. The picture of you and Terry is great - what a good looking couple you make. So glad that you and Terry could get away for nice lunch and a ride to Geneva. Yay for you!! I love the pillow and the picture with your sweetie :) Enjoy every minute!! Hi Kris, How nice to have had a nice day out with your husband. You two look so cute together! I love your pillow you bought, it is just beautiful. I wanted to let you know that I have you featured on my blog showing the gifts I won from your giveaway. You are such a sweet, kind and thoughtful person. Thanks again I was so surprised to win and did not expect it, it was so thoughtful of you! Have a wonderful day and enjoy the rest of the week. If I don't talk to you again have a Merry Christmas. Lovely pic of the two of you Kris. Your new pillows are gorgeous, so when you get bored with them which I KNOW you will, you can send them right over the pond, lol. what a lovely picture of you and terry! adorable pillow finds, kris! continue to enjoy the season:)! I knew I needed to come visit you, Kris! Love your peacefulness! Your day sounds wonderful...we try to take days off like that, too. What a great photo of the two of you...and I LOVE the pillows! Yes, you should use them all year! Love the sweet pillows and the picture of you and your husband. I agree, keep the joy going as long as you can! I have a candle that says it - and it's out always ! That is one gorgeous photo of you and Terry !!! So glad that you had some great alone time. Good for you. The pillow are gorgeous and yes to beautiful to put away. Oh you two cuties! What a fun day. I love days like that!! I am pretty much ready and really enjoying the season. I've done quite a bit of candy making but have given most of it away. All of my girls, dil's, and grands will come on the 21st for our annual 'baking day'. This is later than what we usually do, but it was the only day that worked for all of us. You know how everyone is so busy this time of year. Love the new pillow and the button one is darling as well! I think I may make a button one and put it out for Valentines. Wishing you and your family a very Merry Christmas! Love the pillow! Very cute, pretty and chic. I' m very busy with my handmade creations! Oh, I wish I were done with all my shopping and gift wrapping, too! It sounds like a lovely day with your hubby, Kris. I think we all need to take some time to relax and enjoy the season. Love your new pillow! HI Kris, Love the pillows your found. 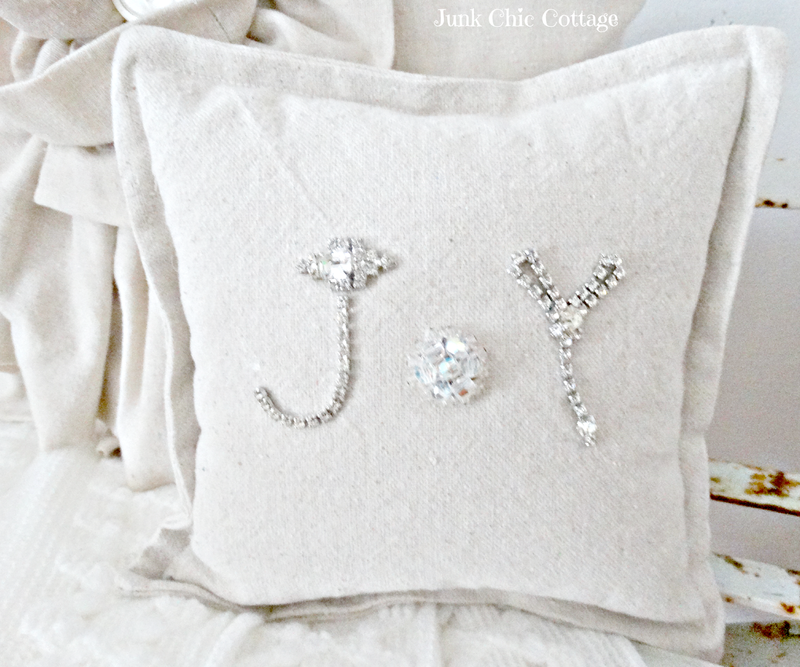 What a great idea to create the word JOY with vintage jewelry. I may have to try that one and the buttons too. Isn't it nice and peaceful to be done with all the preparations and just enjoy the season before Christmas day?? My hubby and I are doing the same and so enjoying it. 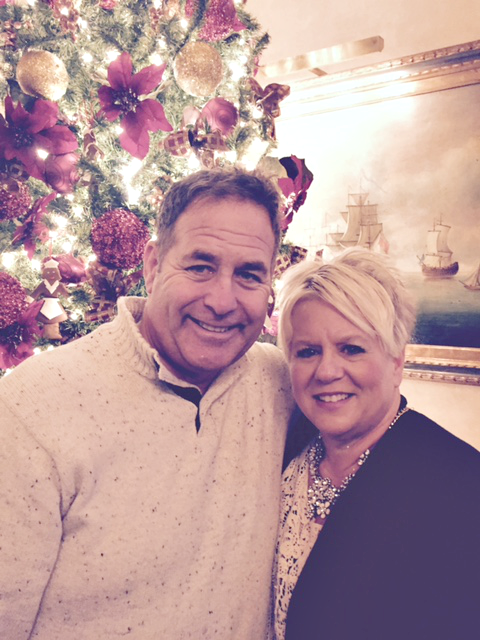 Love the pic of you and your sweetheart Terry. You two are a handsome couple!! Merry Christmas sweet friend and thank you for a wonderful year of friendship in blogland!! Love the pillow Kris and so glad you had a wonderful day with your hubby!....Such special times! The joy pillow is fabulous and so fun!! Oh do I love those pillows! Such a pretty blog. Love you new J O Y pillow I would leave it out also. Your picture with your husband is so nice. You two are such a sweet couple! The pillows are lovely, Kris. EnJOY them! Love you new joy pillow! What a lovely day with your husband. Merry Christmas! I love the pillows! I don't why I've missed your posts. They're not showing up on my reading list. I found you through someone else's post. Hope you've had a Merry Christmas.